play is a public sound installation which responds to people's movement. It invites people of all ages to explore and influence an aural world. The unique composition of play has been crafted to encourage a sense of curiosity and draws on sound bites from Pittwater's environs. This original concept became re imagined as part of the project Syzygy, creating an indoor environment in which to explore projected landscapes. The three month residency at Eramboo Artist Environment involved the collecting of sounds, composing and crafting the technology to work in an outdoor setting. 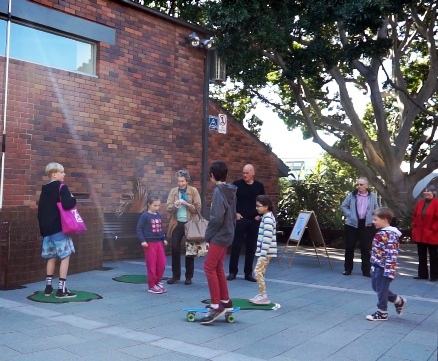 In July of 2014, the public of Pittwater experienced the installation in full swing as they walked, or danced, past the Mona Vale Library.